Brother MFC-J3530DW Driver Download. 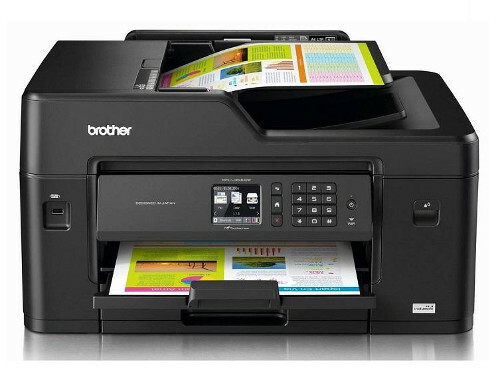 This Brother MFC-J3530DW is a wireless A3 All-in-One printer. Forget about blurry photos, tight spreadsheets, or overflowing documents you can now expand your presentation and present your work without losing details. The MFC-J3530DW is the Brother InkBenefit Professional inkjet all-in-one offering fast, cost effective, A3-sized printing, copying, scanning and faxing (33600 bps). The Brother MFC-J3530DW comes with a number of features that streamline document creation and management, including an intuitive 6.8 cm LCD touch screen. The machine supports high-performance inks that can print up to 3,000 pages in black and 1500 pages in color (for high capacity ink cartridges). The Brother MFC-J3530DW is characterized by high productivity, which perfectly fits into demanding business environments where large volumes of documents are produced. The machine offers automatic two-sided (duplex) printing and is equipped with a 250-sheet feeder tray and a 50-sheet ADF one-sided automatic document feeder. The Brother MFC-J3530DW works on IEEE 802.11 b / g / n wireless networks and uses Wi-Fi Direct for fast printing from PCs or mobile devices without the need for a router. It also features high-speed USB 2.0 and 10Base-T / 100Base-TX Ethernet interfaces. The Brother MFC-J3530DW allows you to print from and scan to mobile devices by supporting applications and services such as Brother iPrint & Scan, AirPrint, Google Cloud Print 2.0, Mopria and the Print Service for Android plug-in. The device also supports direct printing from cloud services such as Dropbox, Evernote, Google Drive and OneDrive. The Brother MFC-J3530DW provides a high level of security for documents created and processed. It is compatible with Brother PrintSmart solutions including PrintSmart Secure Pro for monitoring print jobs and PrintSmart Cost Control for billing and cost control. Extended Warranty for Brother machines is available upon registration at the manufacturer's website within 60 days of purchase. Overall The Brother MFC-J3530DW is the A3 multifunctional device, offers wired, wireless, mobile and cloud connectivity as standard to keep you connected to your home, office and travel team. With the new pigmented inks and individual InkBenefit cartridges that deliver lower print costs per page, you can afford professional print quality for less money. With high speed printing and high monthly duty cycles, the MFC-J3530DW is a reliable and high performance multifunction device for a demanding office environment.